Andy Graydon, City Lights Orchestra, 2018, used street lamps, steel, airline cable, Courtesy of the artist, Photograph by Clements Photography and Design, Boston. Source: deCordova website. 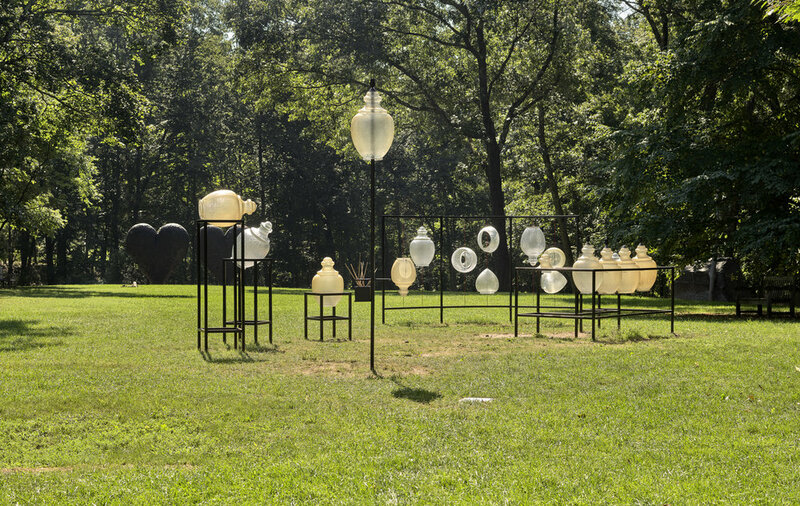 Andy Graydon’s playful City Lights Orchestra on display at the deCordova invites visitors to explore sound through an installation of hollow, plastic lamps. Once used as beacons of light, these discarded Cambridge street lamps now serve as “sculptural instruments”, meant to make noise and be played by visitors and musicians alike. Try your hand as a drummer this fall! Empresses of China’s Forbidden City explores the influential role of imperial women during the Qing Dynasty, China’s last dynasty. To commemorate the 40th anniversary of the formation of U.S.-China diplomatic relations, nearly 200 precious objects are on loan from the Palace Museum in Beijing. This collaborative exhibition is the first to investigate the role of these powerful women in the dynasty, thus shining new light on this historical time period. 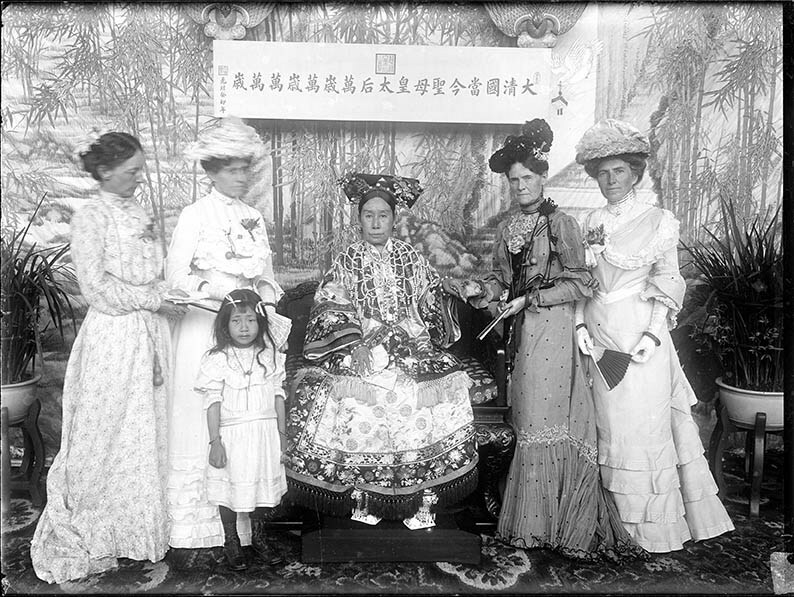 Empress Dowager Cixi with foreign envoys’ wives in the Hall of Happiness and Longevity (Leshou tang) in the Garden of Nurturing Harmony (Yihe yuan). Photographed by Yu Xunling (1874–1943), Guangxu period, 1903–05, print from glass-plate negative, Freer Gallery of Art and Arthur M. Sackler Gallery Archives, FSA A.13 SC-GR-249. Smithsonian Institution, Washington, DC, purchase. Source: Peabody Essex Museum website. If you’re a texture junkie, won’t want to miss this incredible collection of soft pastel pieces currently on display at the MFA. Over 40 works from the MFA vault and on loan from private collections are temporarily returned to the spotlight, providing visitors an exclusive tour of this delicate medium. Masterpieces from a variety of artists are featured, including Mary Cassatt, Edgar Degas, Edouard Manet, Jean-François Millet, Claude Monet, Camille Pissarro, Odilon Redon, and Pierre-Auguste Renoir. Edgar Degas, Dancers Resting, 1881–85. Pastel on paper mounted on cardboard. Juliana Cheney Edwards Collection. Source: MFA website. Wangechi Mutu, A Promise to Communicate, 2017. Installation view, the Institute of Contemporary Art/Boston, 2017. Photo by Charles Mayer Photography. Source: ICA website. Wilhelm Neusser, Nocturne/Doublemoon (1728), 2017, Oil on Canvas, 57in. x 67in. on display at MASS MoCA. Source: Wilhelm Neusser Instagram (@wilhelmneusser). The darkness of the night invites imagination to run wild. In The Lure of the Dark, our imagination comes to life through a collection of contemporary paintings exploring the mystery of the darkness. Over a dozen painters are featured in this group exhibition, including Patrick Bermingham, William Binnie, Cynthia Daignault, TM Davy, Jeronimo Elespe, Cy Gavin, Shara Hughes, Josephine Halvorson, Sam McKinniss, Wilhelm Neusser, Dana Powell, Kenny Rivero, and Alexandria Smith. We’re particularly excited about this show because Wilhelm Neusser’s piece in the exhibition, Nocturne/Doublemoon (1728), is the sister piece to our Nocture/Doublemoon (1729) hanging on our wall in our October group exhibition. Be sure to stop by and see both pieces! Urban setting of this scale were unimaginable fifty years ago, but are becoming increasingly common, especially in the continent of Asia. These towering, sprawling metropolises are centers of the social, political, and environmental concerns of the eleven artists featured in The Museum of Fine Arts, Boston’s Megacities Asia exhibit. Comprised primarily of installations and sculpture constructed from found objects in these megacities, the pieces convey the textures, materials, and overall feeling of the city each artist calls their home. Rather than being contained to one room, portions of Megacities can be found all over the museum and even beyond its walls. The most notable of these outside exhibitions is Fruit Tree, Choi Jeong Hwa’s magnificent twenty-three feet tall inflated bouquet of fruit, on view outside Quincy Market in Boston. Upon descending into the main exhibition hall of Megacities Asia, the first thing we see is a geographical map showing the origins of each artist. The exhibition is constantly putting the work in context, accessible to visitors who may not be familiar with the cities addressed by the artists. Some notable works includes a large, colorful sculpture by Aaditi Joshi, stretching across a corner of the exhibit, textured like a deep-sea coral reef. Upon closer examination, we see that the entire sculpture is made of plastic bags collected from the streets of Mumbai, India, Joshi’s native megacity. The piece addresses the environmental threat of overuse and improper disposal of these plastic bags in Mumbai, looming over the viewer like a twisting, bristling beast. Hu Xiangcheng’s corner of the exhibit, Doors Away from Home (2016), has multiple little rooms, divided and wallpapered with salvaged Ming and Qing-era doors from homes destroyed in Shanghai’s modernization. The doors themselves are pieces of history, and tacked on are photographs of past residents, stickers, wrappers, and children’s hair ornaments—remnants of their legacy. There are mirrors fitted into each window pane; moving through the exhibit, we see ourselves reflected in the work. Hu asks the question that often accompanies rapid cultural change: are we losing something? Han Seok Hyun’s all-green sprawling installation, Super-Natural (2011-2016) is like a miniature city in itself. It is fun to parse through, identifying the mass-produced consumer products from Seoul that make up the piece. The work addresses the environmental issues arising as nature is replaced my man-made and calls out the mirage of “green” products—which are often falsely presumed to be environmentally friendly just because of their color. These works and more are on view in The Museum of Fine Arts, Boston, through July 17, 2016. Be sure to catch it before its gone! One of the best parts of springtime in the arts is watching new installations pop up and old favorites reopen for the summer season. Art in Boston is getting some fresh air as the city awakens from its winter slumber. Take advantage of this years beautiful New England summer to visit these outdoor art exhibitions in and around Boston. As a part of the Museum of Fine Arts Boston's Megacities Asia exhibition, Choi Jeong Hwa's Fruit Tree towers over passerby outside Quincy Market in Boston. The inflated bouquet of fruits is twenty-three feet tall and examines the ideas of natural and artificial, and where we can find beauty in their intersections. Fruit Tree will be up until July 17, 2016. This year the Greenway in Boston will be host to Chicago artist Matthew Hoffman's narrative piece, May This Never End. The work is installed along a fence between North and Clinton Street near Faneuil Hall, and is made up of four foot tall yellow polyethylene letters that begins with the phrase, "Nothing’s for keeps. Except that we must keep going." Discover the rest of Hoffman's words for yourself; they'll be up through the summer and into the fall, exhibiting until November 18, 2016. If you haven't visited the deCordova Museum's sculpture park yet, make 2016 the year you finally see it. Follow the beautiful walk and enjoy the Museum's sculpture collection, comprised of works in a variety of materials, including stone, metal, concrete. The newest piece on view was installed just last year: Beacon by Stephanie Cardon consists of two concrete pillars bridged by hazard-yellow metal cables, which play with the viewer's sense of space by disturbing the way the eye perceives light. Join the deCordova for their annual spring gala, Party for the Park, May 7! The Isabella Stewart Gardner's notable collection extends outdoors to its elegant courtyard. The courtyard is not only host to beautifully crafted sculpture and mosaic work; the garden itself is a work of landscape art that combines horticulture, fine art, and architecture that gives museum visitors a breath of fresh air between the Gardner's indoor exhibitions. An excellent source for new contemporary artists, ArtCube will keep you updated on emerging artists, and what you can look forward to at upcoming art fairs. Darkroom is a Boston organization dedicated to making photography accessible and affordable, showcasing pop-up photography exhibits all over Boston. Their Instagram is a wonderful collection of contemporary photography, as well as a way to keep an eye out for where Darkroom exhibits will be popping up next. Fine artist and dad, Donald Robertson will keep you entertained with great photos of his in-progress and completed work, as well as his adorable twin boys getting into mischief. #BuyThemNothing! Leon Keer’s street art brings the 2D medium right into the third dimension, using perspective to create paintings that literally pop out of the street. His Instagram is a great way to do a double take while scrolling down your feed. Natalia Wrobel's Instagram is a beautiful peek into the life of a Boston-area painter. This Cambridge-based artist presents a great mix of studio, gallery, and fun, and gives us a sneak peek at what we have to look forward to in her April duo show. If you’re looking for contemporary art in the Boston area, the ICA and MFA should absolutely be on your follow list. Their Instagram accounts keep up-to-date on the work they’re featuring, including snapshots of exhibits and studio visits with their artists. And if you’re not following us already, be sure to keep updated with @AbigailOgilvy on Instagram!